Put away your personal information! If you do nothing else, this is one of the most important things to do. You have no idea who is going to be walking through your home. Yes, an agent will be accompanying them, but an agent can’t make them un-see the bank records or mortgage statements or social security card you left out on the kitchen table. Grab a laundry basket and toss clutter into it. There’s not time to do a thorough cleaning, so do what you learned to do as a children: toss everything into a bin or laundry basket and take it with you in the car. If you’re staying in the house, then just put the basket in the car anyways. Put dirty dishes in the dishwasher. If you don’t have a dishwasher, put them in the oven. Potential buyers won’t think to open the oven and look in there for dirty dishes during their tour of the house. Flush toilets and close toilet seats. Turn on all the lights in the house and open all the curtains. Your home will look its best when it has proper lighting. Also, if you have old CFL lights, they take a while to warm up and provide sufficient lighting, so it’s important to turn them on before buyers arrive. Make the beds, if they’re not already made. Wipe down all countertops and sinks with a damp cloth. Take the pets with you! Or put them away. Maybe your dog is super friendly to strangers, but you have no idea what kind of day your dog is having, much less if the coming buyers are afraid of animals. If you’re not taking your pets with you, then put them in their kennels, in the backyard or the garage, and be sure your agent knows. Get out of Dodge! How many times have you considered buying a house where the sellers stalked you from room to room, preventing you from sharing with your family what your thoughts were on the home? Exactly. Give the buyers the space they need to determine if they want to buy the home or not, and give yourself some peace of mind by taking the opportunity to relax outside of the house. Clean up the yard. First impressions are lasting: if there are toys in your front yard, dispatch the children to collect them quickly. If you were in the midst of doing yard work, put away the rakes, the lawn mower, the hose, and anything that could be considered a tripping hazard. Empty the garbage cans and take the trash out. If you have cats, clean the cat litter box(es). Toss dirty laundry into the washer. Don’t worry about turning the machine on, you can do that when you get back. Also, the noise of a washing machine might distract buyers from appreciating the remodeled look of the laundry room. Light candles and spray some air freshener in the rooms. People will see the lit candles and assume the scent comes from them, so if they are normally averse to air freshener and prefer candles, they will react to the pleasant scent more positively. Sweep the hardwood or tile floors and spot-clean anything that looks suspiciously sticky or gross. Put up your “show” accessories, if you have any. For example: a vase of fresh flowers on the kitchen table, the bathroom towels that are meant for when guests are over, etc. Clean all glass and mirrored surfaces. Put clutter away as much as possible. You don’t want your emergency laundry basket overflowing too much! For example: pet toys should go in their proper place, magazines should be stacked and put away, books back on the bookshelf, the throw blanket should be folded neatly, etc. Wash and put away the dishes (or run the dishwasher). Be sure to start the dishwasher first so it has time to run through the noisy cycles before the potential buyers arrive. Sweep the porch and walkways. 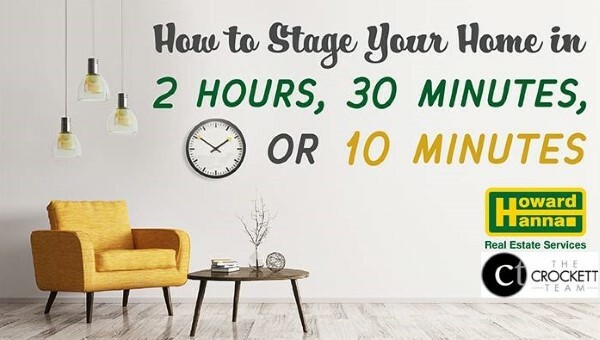 If you have a few days to prepare, take the extra step to really stage your home to sell with our blogs Selling with Success: How to Stage Your Home Effectively and Staging Your Home To Sell During The Holidays. 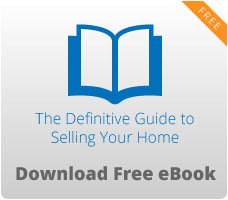 Selling your home doesn’t have to be stressful or headache-inducing. At Howard Hanna Real Estate Services, our goal is to simplify the home buying and selling process for you, and help you make Home Happen Here.® With our one-stop shopping, we offer real estate services, mortgage services, title and escrow services, and insurance services, taking the worry out of moving by walking you through your entire home buying or selling experience. If you’re moving to a new area, our global and local Howard Hanna Relocation Services can also assist you with the relocation process.